A busy 2017 with more mega-IPOs on the horizon. Read the market outlook in our latest report. What makes Europe such fertile grounds for growth? See how Europe’s middle market is driving economic growth with a new confidence. How is external talent accelerating growth for family businesses? Find out why family businesses are growing faster than their non-family-owned peers. How can private companies leap forward during uncertainty? Explore how private companies act fast to grasp opportunities for growing market share. Congratulations to Murad Al-Katib, President and CEO of global agribusiness corporation AGT Food and Ingredients Inc. on winning the 2017 title. Learn how EY Entrepreneur Of The Year® award winners outperform and outlast the competition. Can shifting sands be a solid foundation for growth? Find out how today’s fastest-growth businesses use talent and tech to drive the global growth agenda. The upward trend for global venture capital in 2014 is likely to continue, with a consistent pipeline of new IPO listings and improved investor confidence. Our G20 report highlights recommendations and actionable guidance based on best practices adopted by governments. What’s the right path to accelerate your growth journey? Whatever your growth aspirations — from local to global, challenger to leader, millions to billions — we can help you achieve your goals. For more than 30 years, we’ve been helping companies accelerate growth. We’ve worked with the world’s fastest-growing companies, combining our insights, experience, global resources and industry capabilities to help them develop ground-breaking approaches to achieve their market leadership aspirations. Through examining the growth trajectories of these companies, and with the collective insights gained from in-depth interviews with winners of our EY Entrepreneur Of The Year™ program, we have developed a unique framework — the EY 7 Drivers of Growth — to help companies strategically set their growth plans. Select a driver below to discover more about the EY 7 Drivers of Growth and to view insights that could help you to think differently about your route to growth. Discover how technology and data are helping cities to become resilient. We’re already planning for World Entrepreneur Of The Year 2018 in Monaco. Are you? 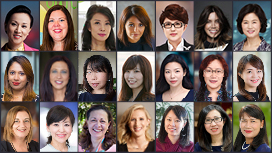 Find out more about the promising women entrepreneurs selected for the EY Entrepreneurial Winning Women™ 2019 program. Take a glance at the 30 fast-growth startups selected to join the 2018 program.